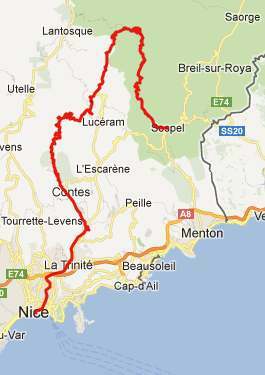 This is the highest paved pass, reachable in a conventional day loop ride from the Nice/Menton area. There are many ways to skin this cat, so many ways that you might think you're in paradise. No real skin involved, I mean of course the incredible variety of approaches. Three roads meet at the top. But there are three different ways to climb Col Ste Roch, which is a shoulder point on one of the southern approaches. This already brings the possibility of loop rides close to the double digits. Below are just a few notes on the approaches I tried out. Scenically the most interesting part of this pass is the Gorge du Piaon on the South-2 approach. Every approach also has one extremely interesting medieval town to explore, Coraoze on the South-1 approach, Luceram on the South-2 approach and Bollene-Vesubie on the eastern approach. The summit itself would have no interest, if it were not the highest point along the route, or the starting point for a climb to l"Authion. 04. (12.7km,0130m) there is an extra loop of 1km here, that is due to an error in the mapping program. From South-1. The profile starts in Nice and follows the busy road up through La Trinite, the Condamine Housing Project to Drap, then D15 into Contes. On the map the road north of Contes looks no differerent than to the south. But in reality it couldn't be more different. The route is a busy suburban highway to the outskirts of Contes. Then all of a sudden the traffic seems to just disappear as soon as the road starts climbing, at least that was my pleasant experience on a Friday in the middle of May. A carrot dangling in front, also a reason to keep climbing, remains in the center view for a long time, the hill top town of Coraoze. It is easy to forget about time wandering around the cemetery on top of this town. You might call this a resting place with a view - final or temporary. Past this rest stop, the road descends a bit, and then really gets down to business, as the serpentines, held in place with precision brickwork, snake their way to the first pass. This would be Col de Savel (980m). On top the viewshed changes to the north. This would be the highest point on a loop ride, combining this approach with a descend on the right down a signed and numbered dirt road to Luceram. The paved road past Col de Savel keeps on climbing, traversing along a breadloaf shaped ridge. The road visible below towards the west is the approach from Luceram to the next named pass on this route, Col de Ste Roch. The approach described here descends a bit before reaching Col de Ste Roch. I stopped here and ate my picnic lunch, while my bicycle posed for a photograph under the colorful crucifix. What ? "only a crucifix, no restaurants ? no hotels and souvenir shop or bars for the motorbikers ? Maybe you can tell from my reaction that I was more only familiar with conditions on mountain passes in the northern alps at this point. The traffic too was amazingly sparse. I don't remember seeing a car between the far outskirts of Contes and here, although one or three might have slipped my mind. But up here I vividly remember a young kid on a motor scooter, test riding the poor thing into the ground. I think he wants to grow up to own a Lamborghini instead of a Pinerallo. From my especially enjoyable lunch vantage point I noticed a road far above. I thought that this was probably the third approach to Col Ste Roch, also going over Col de Porte. But I turned out to be wrong. After lunch I found myself climbing up there towards the Col Turini. After the first switchbacks the first views of the still snow covered peaks appear. Soon the road levels out a bit and enters a magnificent large needle forest, following the edge of a gentle ridge, from which views of the peaks can be caught between the trees. There is just one settlement on this long last part of the approach, Peira Cava. I managed to refill my water bottles here, but it looks like they can provide food and lodging, even as early as mid May. From here on a road sign every km feeds the cyclist info on the remaining climbing meters before the summit, the remaining distance and the average climbing grade. Something the signs don't tell you is that the road reaches several slightly higher points just before the pass. The nicest views along this approach, in my opinion, are back before of Peira Cava, with the high peaks of Mercantour Park in the background. From South-2 (described downwards) Turning hard right from the South-1 approach leads to a road that is signed to Sospel. The first part of the descend is a long roll through isolated dense forest. l'Authion looms overhead, almost in the sky. But down here it's quiet and peaceful and no far panorama disturbs with excitement. A picturesque church in Moulinet finally provides a change in scenery. Then all of a sudden all scenic hell breaks loose, as the road goes under an unlikely bridge that seems to be there, just to underline the picturesque location of a chapel on the rock outcrop above. As you pass under the bridge, the road enters the Gorge du Piaon. These massive slabs of rock could be from any continent with magnificent limestone canyons, but the walled switchback road constructions and the impeccable road surface could only be from the Maritime alps. This short section through the Gorge du Piaon is scenically by far the most memorable part of the ride. Before entering Sospel, a right onto the road over Col de Braus provides an opportunity to get into the right drainage basin again, if the starting point was Nice. From East. (described upwards) The pass can also be approached from the Nice area via the valley of the Vesubie and D2565. The route leaves the gorge north of Lantosque. The hill town of la Bollene-Vesubie is another spectacularly perched hilltown. Bollene has its own tourist office, so there are opportunities to stay there. A small chapel a little further up is another opportune stopping point to admire the road construction. Past this point the road uses switch backs to climb the opposing hills side, providing a new vantage point, from where the lower switchbacks look like spaghetti salad. After the road enters the forest and leaves the mountain rim, it is still several hundred feet of relentless climbing to the top. At the summit the road passes suddenly and unexpectedly between two hotels and a bus stop labeled "Col de Turini" to a junction with the other two approaches. Cycling: Surprisingly this pass was used only three times, as part of the Tour de France route, even more surprisingly all after WW2, when Maritime Alp passes were used even less. The years were 1948, 1950 and 1973. The stages were won by two French and a Spanish cyclist. Col de Turini , Col de Castillon: Lantosque > Col de Turini > Sospel > Col de Castillon > Menton > Bordighera: 62.9miles with 5420ft of climbing in 6:23hurs (VOD MC1.0 m4:12.5.26).